One of the projects keeping me busy is recording (with the help of renowned musician Mark Dago) the audiobook of my first novel, Lost at the Con. We'll be done with the final product by the end of the month and it should be available by the beginning of November, but we have Chapter One finished and I wanted to share it with you guys for free. 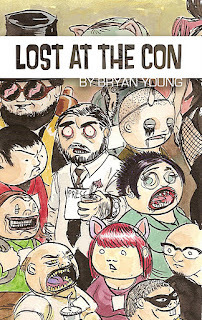 CLICK HERE TO DOWNLOAD (or listen) TO CHAPTER ONE of LOST AT THE CON, as read by me. If you like what you hear, you can pick the book up at the Lost at the Con website (click the "Order Now" button to buy signed copies, or there are links to the digital copies). If you'd prefer to wait for the rest of the audio book, you can preorder it by clicking the link below. There are two options, one for digital download and one for having a CD shipped to you. The CD will have the eBook copies included. It should ship by the first week of November.